Berlin, 25 April, 2018: BondFilm® HF is Atotech’s new process for the treatment of inner layer cores. It leads to highest bonding performance in the manufacture of multilayer & HDI printed circuit boards. This innovative new process maintains the excellent performance first developed in the BondFilm® product range whilst offering the lowest possible signal loss as required in high frequency applications. Circuit design is already planning towards the low signal loss requirements of the next generation of network technology, the so called 5G. To meet these signal integrity demands the ideal would be to use a non-etching adhesion promotor system. However, whilst such systems are available in the market, they are not yet widely established. BondFilm® HF bridges the gap with significantly reduced surface roughening which helps meet the signal integrity requirements whilst maintaining excellent bond strength and functional performance. The latest development in Atotech’s BondFilm® product range is BondFilm® HF. Copper panels treated with BondFilm® HF have the typical uniform, brown organo-metallic coating long associated with the BondFilm® process. This coating retains the excellent enhanced bonding between the inner layer and prepregs used in multilayer manufacture but with one significant difference: only minimal roughening is needed. 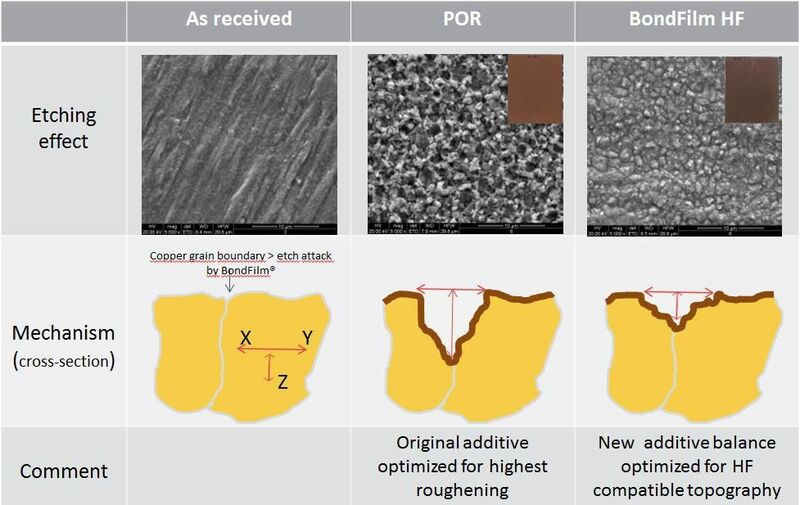 In previous versions of the BondFilm® process development targets have been to maximize the surface roughening to give the best possible multilayer bond strength; here, the target was to provide this functional performance without compromise but with a minimal roughening of the copper traces. By producing this low roughening of the copper surface a significant reduction in signal loss in the „skin“ of the copper traces is achieved. This makes BondFilm® HF more suited to high frequency applications where signal integrity is paramount. Production trials using BondFilm® HF focused on the functional properties of the multilayer boards together with electrical signal loss measurements. Data shows that panels manufactured with BondFilm® HF fulfill all reliability tests considered, such as thermal stress tests and performance multiple iR reflow cycles. At the same time they significantly outperform panels made with conventional treatment processes in terms of reduced signal loss. BondFilm® HF is a simple drop in replacement for existing BondFilm® process users. Its short process sequence is also compatible with most existing oxide alternative lines. The process is already installed in a leading Chinese manufacturer and shows excellent results with first customer evaluations. Its key benefits in terms of significantly reduced signal loss gives this new process a considerable advantage for all high frequency applications.